If you are preparing to place artwork or mirrors in a storage unit near Santa Cruz, CA , it is important to pack your items carefully. In order to pack your picture frames, you will need brown packing paper, mirror boxes, a roll of packing tape, and a marker. When you are packing your mirrors or picture frames, you can start by folding your packing paper around your item. With the paper carefully folded, you can tape your frame securely. For a look at how to store frames and mirrors, watch this video. A company offering portable storage units will be able to provide you with handy tips on how to pack, move, and store your belongings. With services from a top rated storage rental company, you can ensure that your personal items are fully secured when they are not in use. If you are preparing to pack up documents so that you can place them into a self-storage facility , you need to use the right kind of storage boxes to do it. Watch this video to see how to build a file box prior to using professional storage services near Capitola. File boxes are designed specifically to hold important documents that are going to be stored inside of a self-storage facility. Whether you have letter or legal sized documents, you will be able to keep them safe and secure when you use the correct file boxes. Any company that specializes in providing professional storage services should be able to provide you with them, and you won’t have to worry about finding files later when you decide to utilize them for storage. Being a student often involves living in shared accommodation, with only a limited amount of space to store belongings. Small dorm rooms can quickly fill up with items that are rarely used. As a student, you may also have to change housing frequently. 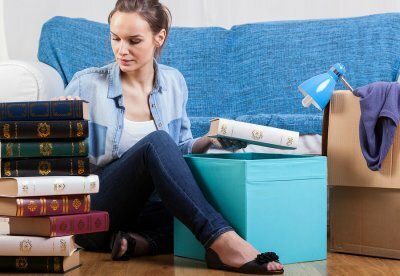 Renting student storage near Santa Cruz can provide a practical solution. A self-storage unit can be a convenient place to store furniture and other personal items during summer break. This can save you from having to transport heavy goods across country to your family’s home and back. A self-storage unit can also serve as a useful place to keep clothing which is not in season, text books which will not be needed until a future semester, and other items that are not currently being used. Keep in mind the following when choosing a storage unit. Protect your clothes, books, and other possessions from damage by storing them in airtight or vacuum-sealed bags. If you are storing a small fridge, keep the door propped open to prevent the growth of anaerobic molds and mildews. Never store perishable food items, firearms, explosives, fireworks, or any other potentially dangerous items, or illegal substances. Choose a facility in a safe part of town, with excellent security. There should be security cameras, on-site staff, and a perimeter fence. Both the facility itself and the individual units should be locked. A reputable facility will generally have electronic keypad access or distribute keys to renters. As an additional security precaution, you may be asked to provide ID. Check the opening hours of the facility to make sure that you will have access to your belongings if and when you need them. Many storage facilities offer discounts for mini storage units. Check to see whether you will need to pay a deposit and also enquire about any late fees.